Trump's Tax Plan Renews Anxieties About Deficits And The Debt One hurdle for President Trump's proposed tax cuts is the threat that they'll produce large budget deficits and balloon the U.S. debt. Prominent Republicans are already expressing great concern. Treasury Secretary Steven Mnuchin briefs reporters on President Trump's tax plan at the White House on April 26. President Trump has proposed big tax cuts for businesses and individuals — breaks that could reduce federal revenue by trillions of dollars. Economists and tax specialists say that unless they're paid for, the tax cuts could explode budget deficits and the national debt. The prospect has prominent Republicans and Republican members of Congress worried. 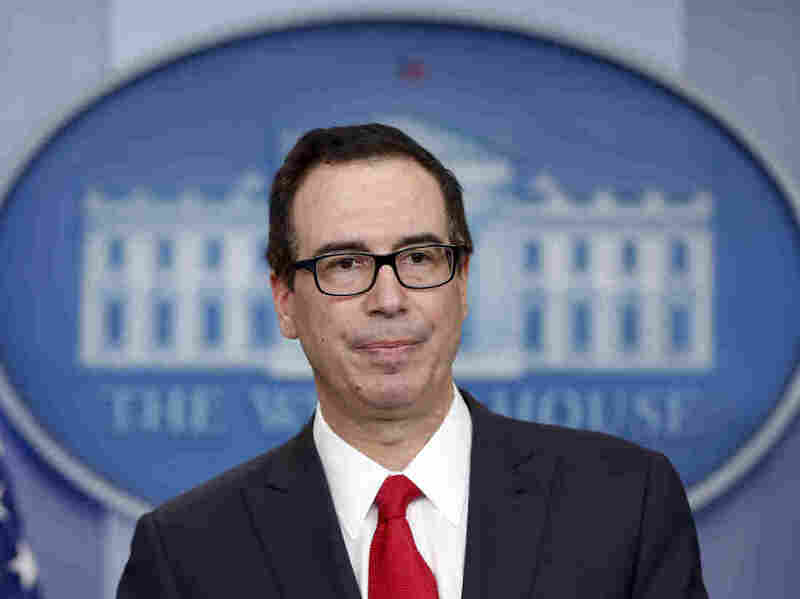 When he unveiled an outline of the President's tax proposal in April, Treasury Secretary Steve Mnuchin minced no words: "We will have a massive tax cut for business and massive tax reform and simplification." Mnuchin said the tax cut will largely pay for itself by boosting U.S. economic growth, "back to 3 percent or higher." That's about double the growth rate in the economy last year. David Stockman, the budget director in the Reagan White House in the 1980s, is highly skeptical. "The idea that some combination of loophole closing plus added growth would pay for this 7 1/2-trillion-dollar revenue loss that they're talking about, I think is just completely fanciful and irresponsible," he says. But, Stockman says, the argument does have a familiar ring: "It's the same story they told back in 1980s when I was there and I never believed it." Stockman said he believed tax cuts would produce "some additional economic growth." But, he told colleagues in the Reagan administration, "most of the revenue loss has to be paid for with spending cuts. You have to earn it. You can't, you know, wave a magic wand." The Trump administration says one other place it will get revenue for its big tax cut is by closing tax loopholes. But Stockman is skeptical Congress will go along. Take the $180 billion a year companies deduct for providing health benefits. "Not a chance that would be tampered with," he says. How about the $200 billion a year companies and individuals deduct for contributions to pensions and retirement plans? "I can't believe there's a remote possibility they would tamper with that," says the former budget director. And, Stockman points out, the administration itself has taken popular deductions like the ones for mortgage interest and charitable giving off the table. Selling tax cuts that aren't paid for will be even more difficult because the nation's debt is already projected to move dramatically higher. The nonpartisan Congressional Budget Office says by 2035 it will return to the record levels experienced just after World War II. That's without the potential trillions in debt that could be added by the Trump tax cuts. Stockman worries that to finance the debt the government will soak up funds in the economy that would otherwise be invested in businesses "and therefore slow down the growth of productivity." That could hurt U.S. living standards. Many Republicans in Congress have made deficit and debt reduction a huge issue. Members of the conservative Freedom Caucus have been vehement about it. And moderate Republicans like Rep. Tom Reed of New York are also concerned. "Until you see the entire picture, I'm going to keep my powder dry," he says. But, "that type of debt increase is something I would be gravely concerned about." Reed, who spoke to NPR while making the rounds back in his district in western New York, says he hopes Trump and the Congress can find a way to pay for the tax cuts. "Hopefully there's a way we can bridge this difference and make sure that we get to revenue neutrality," he says. For Reed, that could include supporting a modified form of the border adjustment tax, the tax on imports being pushed by Paul Ryan and other Republican leaders in the House. GOP '200 Day' Agenda Calls For Spending, Tax Cuts. But What About The Deficit?